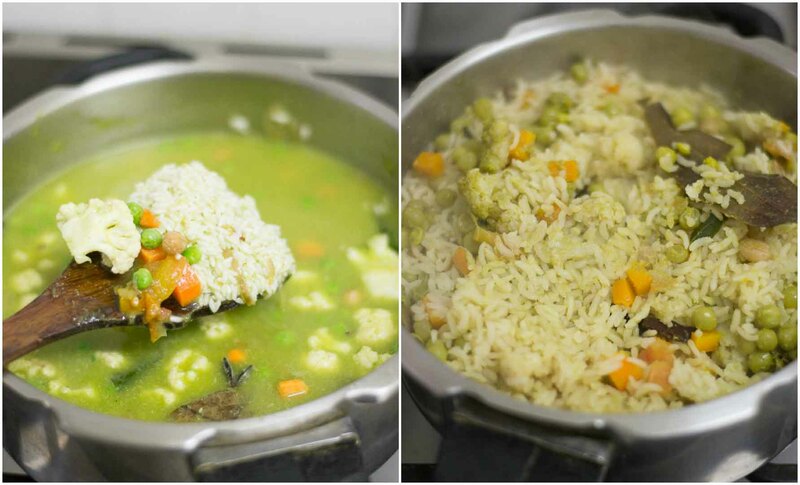 One pot tarkari palav / vegetable pulao recipe using veggies and home made masala. Perfect recipe for lunch box and can be made in under 30 minutes. Suitable for lunchbox. 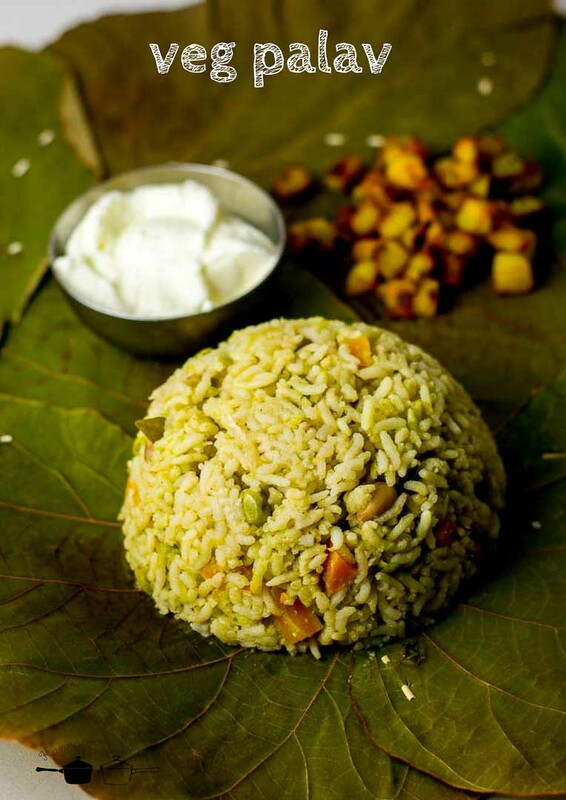 In Karnataka, the vegetable pulao – tarkari palav is made slightly differently. 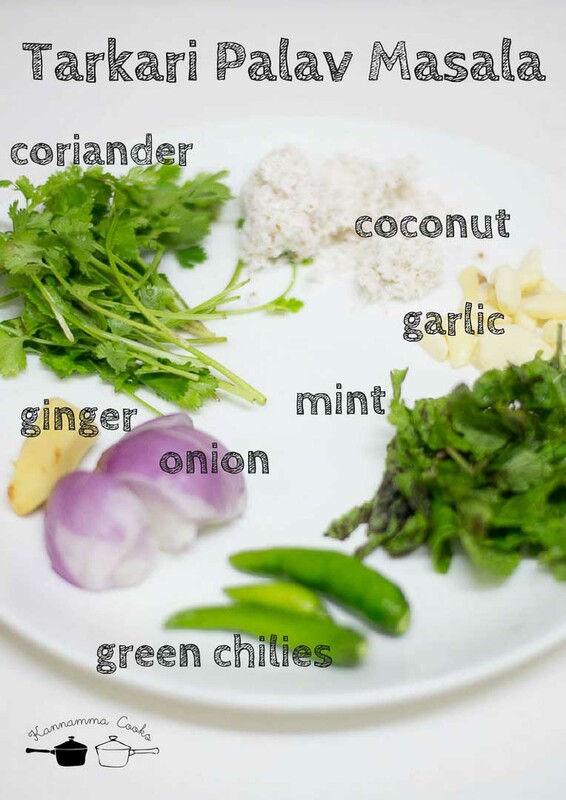 A green paste made with herbs and spices is ground and added which adds a very subtle aroma and flavor to the pulao. This is a very easy recipe to put together. 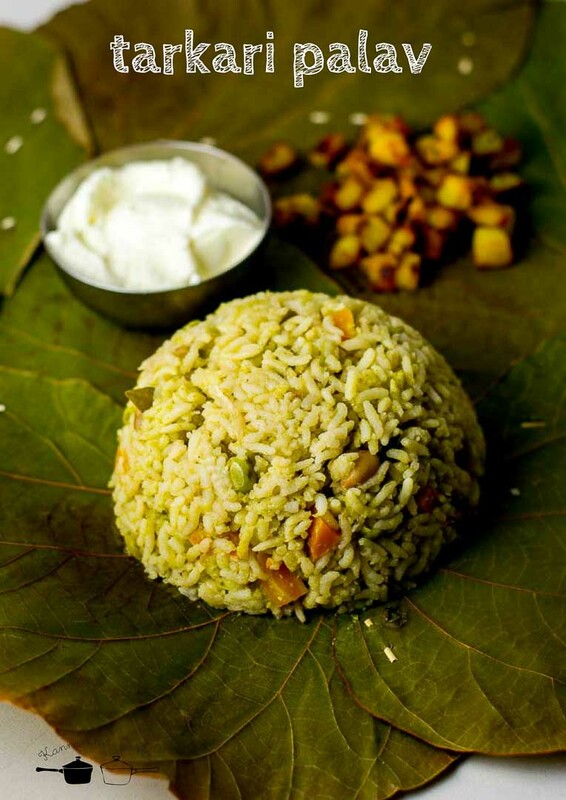 Usually sona masuri rice is used for this recipe as opposed to basmati or jeera rice. 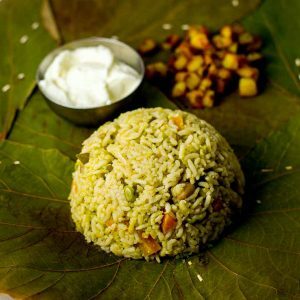 Any variety of raw rice will work for this recipe. 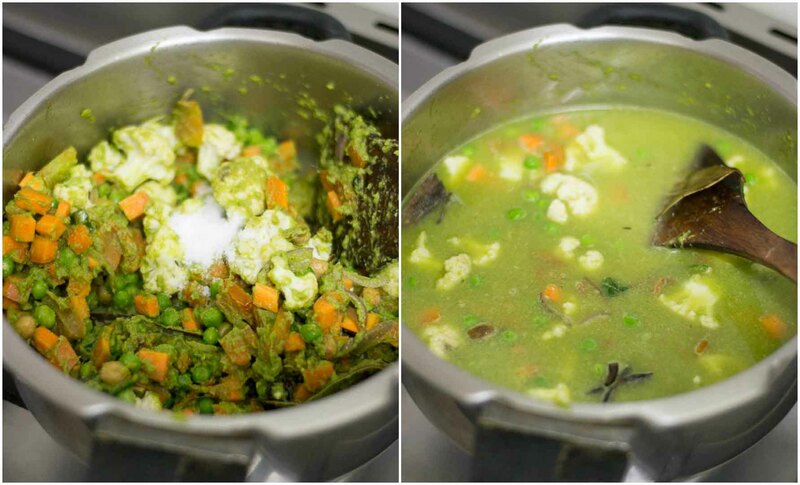 This is the key step to making vegetable palav. This masala is what makes this recipe very different. Grind all the ingredients listed under tarkari palav masala to a smooth paste. Add half a cup of water while grinding. Set aside. 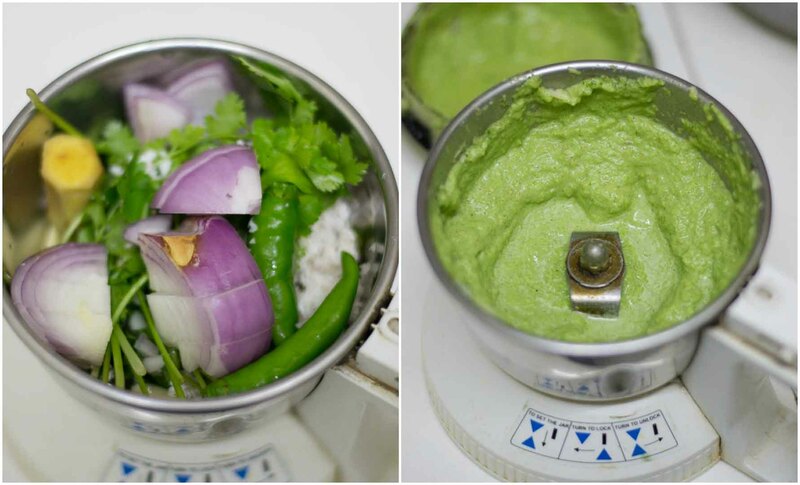 Note: If you need a very spicy palav, add more green chillies while grinding. I have added three chillies today and that was enough. First soak the rice in water for 30 minutes. I have used sona masuri rice today. Any raw rice variety will work for this recipe. 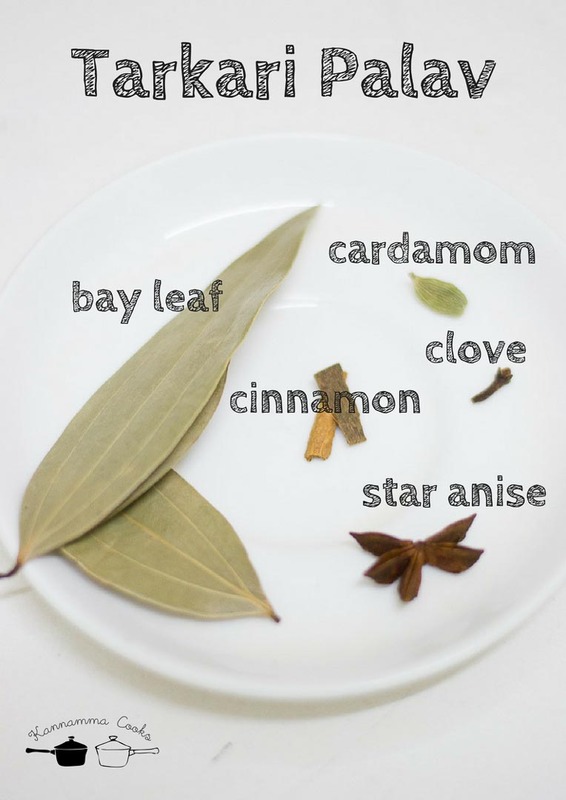 We will need the following spices. Heat oil in a pressure pan and add in the spices. Saute for a few seconds. 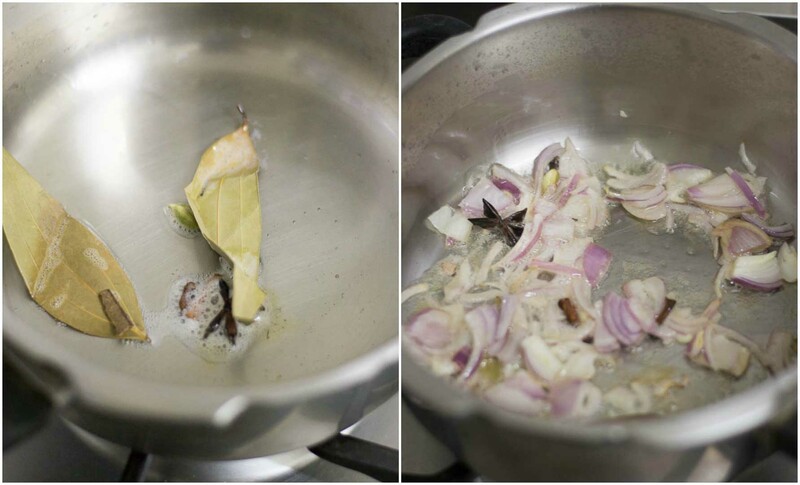 Add in the sliced onion and saute for 2-3 minutes. 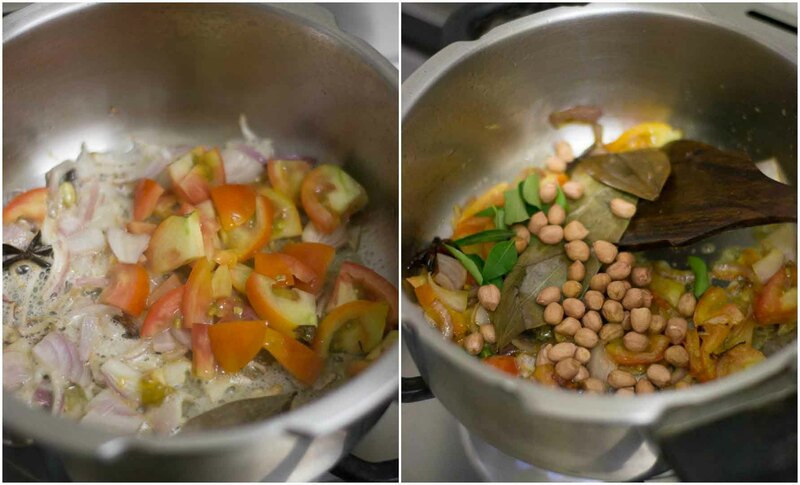 Once the onions are soft, add in the chopped tomatoes, curry leaves and peanuts. Peanuts is optional but it adds a nice texture and bite to the palav. Once the tomatoes are cooked and soft, add in the ground masala and mix well. Saute for a couple of minutes. Now add in the veggies. 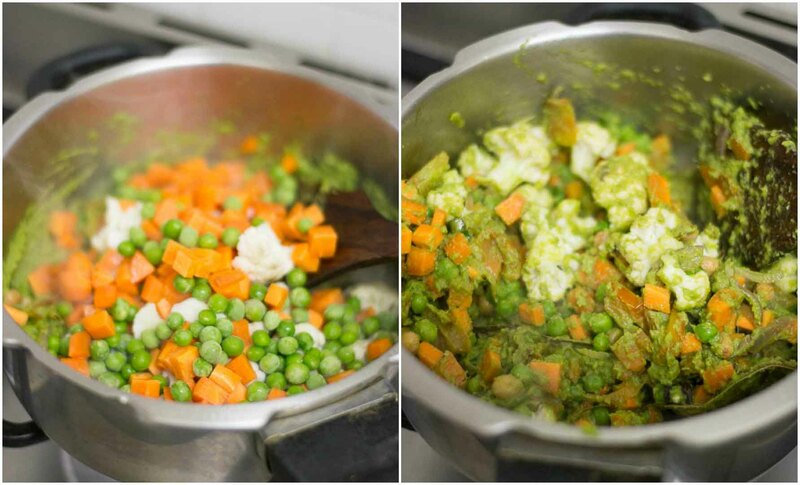 I have used carrots, cauliflower and green peas today. You can use whatever veggie you have in your fridge. Beans, knol khol, potato all work well in this recipe. 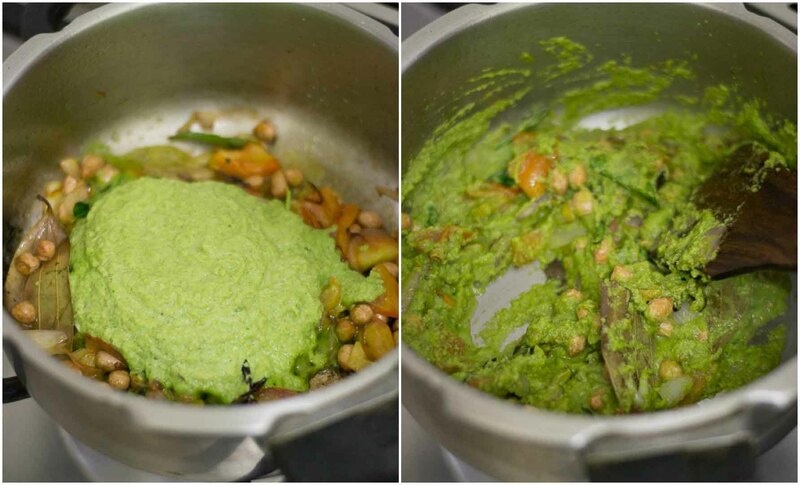 Note: If using dried green peas, soak the peas over nite and add it. Add in the salt and the water. For every cup of rice we use, we will add two cups of water. Once the water is boiling, add in the soaked and drained rice and let the mixture come to a boil. Once the mixture boils, cover the pressure pan with a lid and leave it exactly for 2 whistles on medium flame. Switch off the flame and let the pressure from the cooker release naturally. Vegetable palav is ready. Serve hot with kurma and yogurt. Note: At the end, one can add fried bread croutons and that also adds a nice taste and texture to the palav. Just fry couple of pieces of chopped bread in ghee and mix it before serving the palav. 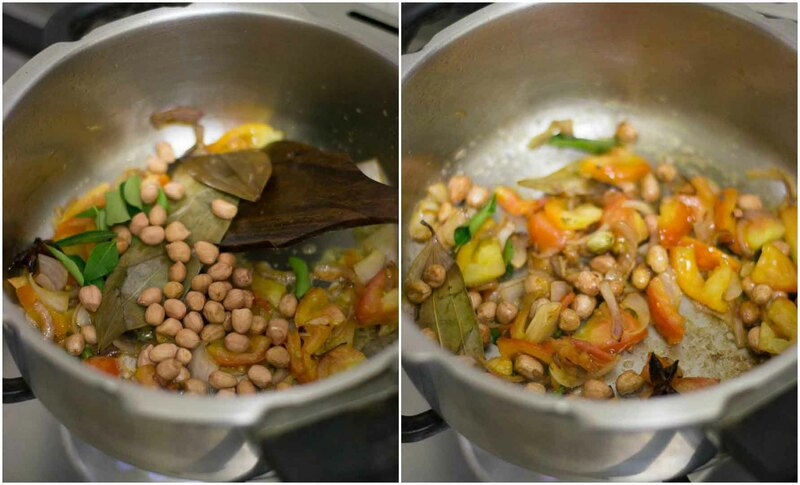 Once the onions are soft, add in the chopped tomatoes, curry leaves and peanuts. Saute for a few minutes. Now add in the veggies. Add in the salt and the water. I’m a big fan of your recipes and looking forward to try this one too.